Throughout my 15+ year career, I’ve seen countless diet and weight loss tactics, from powders, pills and potions, to unorthodox treatments, like ice baths and ear clips. When clients inquire, “Should I try this?” my first step is to check out the science, and often times, there isn’t any. Throughout my 15+ year career, Iâve seen countless diet and weight loss tactics, from powders, pills and potions, to unorthodox treatments, like ice baths and ear clips. When clients inquire, âShould I try this?â my first step is to check out the science, and often times, there isnât any. While that doesnât mean thereâs no validity, it does mean there are many unanswered questions, like how much, how often, and what are the side effects? In my research, I sometimes find that even products and approaches with studies behind them carry more risks than benefits. For these reasons, many experts maintain a skeptical eye. One University of Alabama professor made quite a few headlines this week by calling most weight loss aids a waste of money, including some celebrities swear by. But, I get it, because the primary mantra in health care is always: first, do no harm. Thatâs why my go-to bag of tricks is full of safe techniques grounded in research. It may seem counterintuitive, but eating more fat is a smart weight-loss strategy--as long as itâs the right kind. Researchers at UC Irvine discovered that oleic acid, a âgoodâ fat, helps trigger the small intestine to produce oleoylethanolamide, a compound that finds its way to nerve endings and transmits a hunger-curbing message to the brain. Great sources include nuts, avocado and extra virgin olive oil. Bonus: fat also delays stomach emptying, which keeps you fuller longer. Arizona State University researchers found that cutting food into smaller pieces boosts satiety more than eating one larger piece of food with the same number of calories. College students given a whole bagel ate more of it and downed more calories at a subsequent meal than those who were served the same bagel sliced into four pieces. Test this trick on yourself, or reach for âlooseâ foods, that naturally provide more, smaller pieces per serving, like grape tomatoes, berries, grapes, popcorn, nuts and seeds. In one Brazilian study, researchers found that in addition to burning calories and revving up metabolism, exercise can restore the sensitivity of neurons involved in satiety, which in turn, naturally curbs food consumption. Even a walk will do. Another study from the University of Exeter found that taking a 15 minute walk, rather than a 15 minute break, cut snacking at work by 50%. Incorporating fragrant seasonings into each meal, like fresh grated ginger, fresh mint, cinnamon, rosemary and basil, is one of the core philosophies in my newest book S.A.S.S! Yourself Slim. In addition to adding flavor and antioxidants, aromatic foods may also help you eat less. 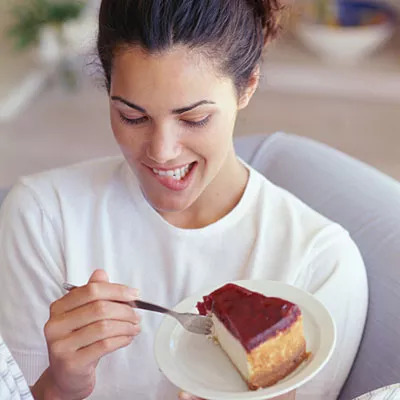 In one study, when subjects had the ability to control their own dessert portions, they ate 5-10% less of stronger smelling selections. Whole grains are hot, but whole rye foods may cause you to nibble less than their whole wheat counterparts. Research shows that rye triggers a lower insulin response, boosts post-meal fullness, and results in naturally eating less at the following meal. The easiest way to enjoy rye is in the form of crackers, but itâs also being incorporated into more foods, like rye pasta, and rye flakes, an oatmeal alternative. Scientists from the University of Birmingham looked at how remembering the same dayâs lunch influenced the amount of salty or sweet snacks eaten later in the day. Volunteers who were asked to recall their lunch, versus their commute, ate less of the treats they were allowed to nosh on in unlimited amounts. Youâve been hearing it since you were in grade school, but breaking the fast, the origin of the word breakfast, is a rule to live by. In addition to jump-starting your metabolism, a morning meal has a ripple effect on your intake. Breakfast skippers eat 40% more sweets, 55% more soda, 45% fewer vegetables and 30% less fruit than those who eat breakfast. In addition, breakfast skippers are 4.5 times more likely to be overweight. For the best balance, aim for a combo of fruit, whole grain, lean protein, and healthy fat, like this mango parfait. If you tend to eat on-the-go and gobble down your food, work on s-l-o-w-i-n-g it down. A study published in the Journal of Clinical Endocrinology & MetabolismÂ found that eating too quickly curtails the release of hormones that induce feelings of fullness, which can trigger mindless overeating. Another University of Rhode Island study found that slow eaters take in about four times fewer calories per minute, and experience a higher level of satiety, despite eating less food. To get on board, put your utensil or food down between every bite, take a deep breath, and stop eating when you feel youâve had just enough, even if you havenât cleaned your plate. Soft lighting and music arenât just for romance. Cornell University researchers discovered that they also help rein in eating. Under these conditions, restaurant diners rated their meals as more enjoyable and consumed 18% less, enough to result in losing between 10 and 20 pounds over a yearâs time.